You have a wide choice of questions and actions to choose from. In this article, you will find all the knowledge about them. Questions allow you to know your clients better by asking for the evaluation of your services and products or gathering contact information. In single choice questions (single answer selection), the respondent can choose only one answer. 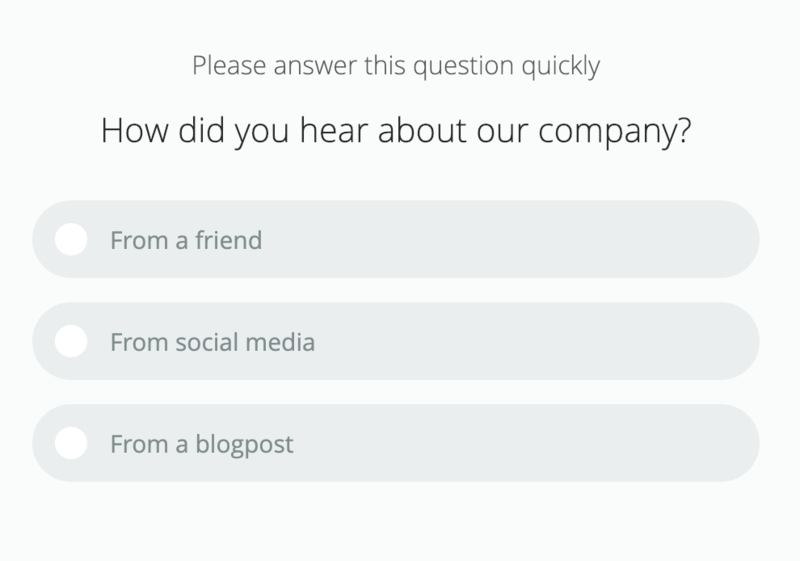 This question is great for not-so-engaged users, (for example ones that want to leave your page) or to implement logic in your survey. Multiple choice questions (multiple answer selection) let your respondent choose more than one answer. 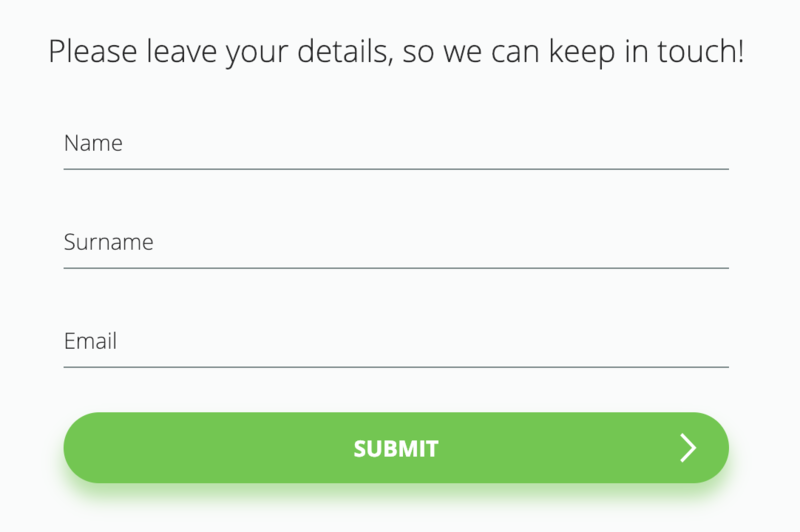 Answers are sent after clicking the "Submit" button. Keep in mind, that you can't apply logic to multiple choice questions. Text answers allow you to gain more qualitative feedback. It's perfect if want to get to the core of a certain problem or understand customers motives better. Net Promoter Score allows you to measure how likely people are to recommend your products and services to others. The tool is excellent for measuring how your customer-facing changes impact people opinions about your company over time. Answers are grouped into Detractors (scores 0-6), Neutrals (scores 7-8) and Promoters (scores 9-10). You can use the survey logic for those three groups, not for specific scores. Smiley scale is a great tool for measuring customer satisfaction. It is possible to apply logic to this question so that you can measure the level of your clients' satisfaction with incredible precision. If you want it is also possible to change the order of smileys. 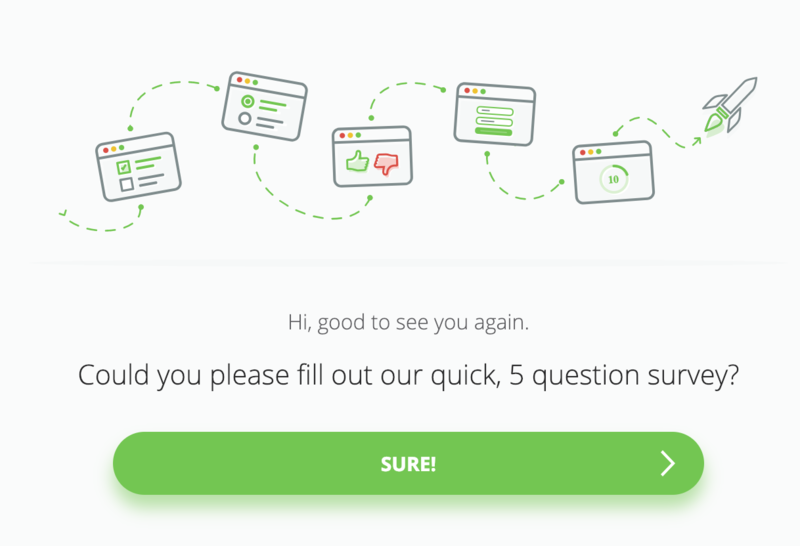 Survey invitation is a place where you can ask if a visitor wants to answer your questions, and describe the purpose of the survey. 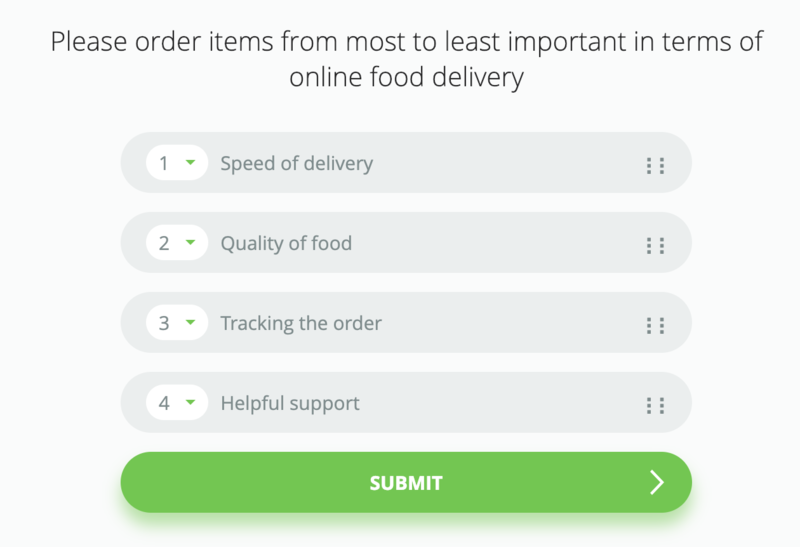 After clicking on the customisable button, the first question in the survey will be displayed. The date is great for client demographic segmentation, asking when visitor registered or bought a product. Rating ⭐️ is the perfect tool for collecting feedback about your products, services, new website, etc. You can apply logic to every rating you get and customise looks of your icons! Dropdown list lets respondent choose one of several options. Small size makes it unobtrusive for a visitor while allowing you to display lots of answers. 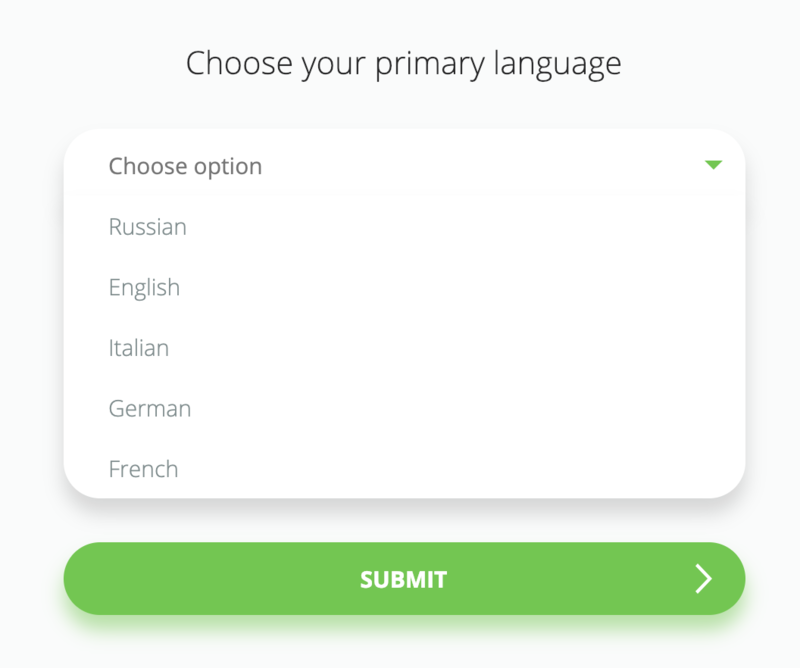 It's the best choice when you want to ask users about their region or language. The Ranking question asks respondents to compare items to each other by placing them in order of preference. The most preferred item goes on top of the list, and the least preferred is placed by respondent on bottom. A Matrix question asks respondents to evaluate one or more row items by choosing a column for each item. Thank you message is considered a good practice as they provided you with valuable information and it just shows your company as more user-friendly 😊 Simple text should be enough, but you can as well use gifs and pictures. It can be closed automatically after a chosen number of seconds. Call to action is extremely useful to make clients take a specific action, such as checking special offer, seeing other products, etc. 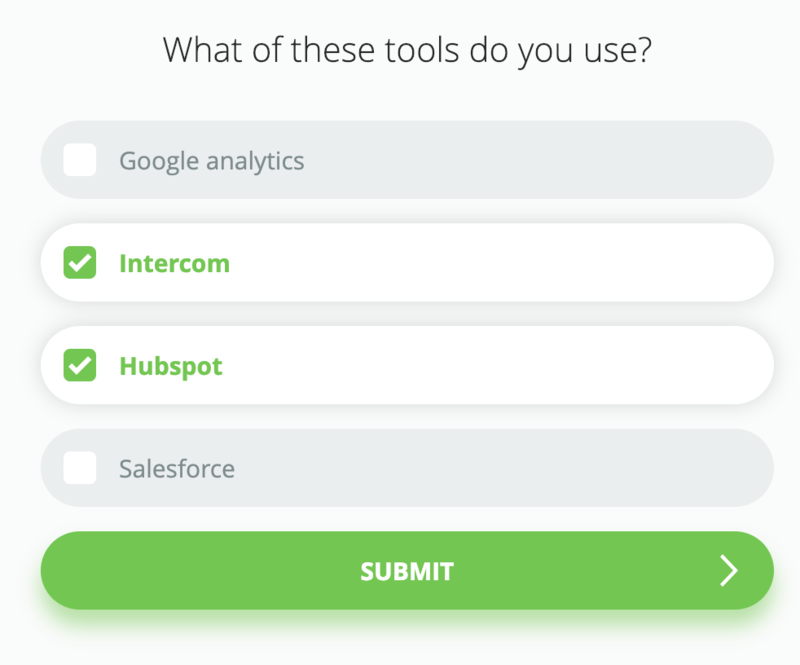 This way you can keep them engaged longer, especially on an exit intent surveys. Page redirect immediately redirects respondents to a specific page upon an answer. A redirection page can be opened in the same or a new window tab. Page redirect with delay would be of use when you decide that respondents should know that they will be redirected to a different page. We’ll display a message with a countdown that will show how many seconds were left to the redirection. Start a chat is especially useful if you have questions about usability or someone picks an answer pointing to encountered bugs – opening a chat prompts this respond to reach out and tell you more about the problem or ask questions. This feature works for chat apps such as Intercom, Drift, LiveChat and more. Add cookie assigns a cookie to a respondent. You can use this cookie to target follow-up surveys and personalise the user experience. If you want to, you may choose the period after which this cookie will expire. 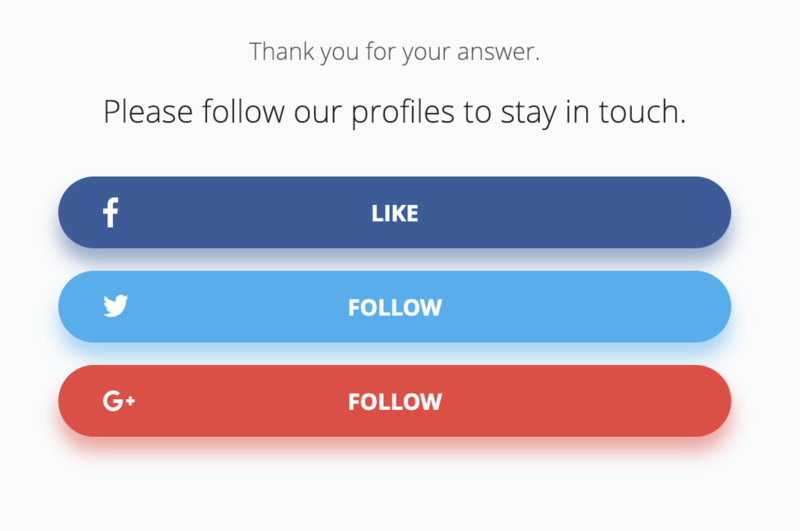 Social CTA encourages your users to follow you on social media. You can choose which buttons you want to add. As we tried to explain all types of actions and questions, we are sure, that we didn't think of all the possibilities. So try them on your own!